Предлагаю вашему вниманию упражнения для отработки темы Passive Voice/Страдательный залог. Упр. 1. Раскройте скобки, употребляя глаголы в Present, Past или Future Simple Passive. 1. Bread (to eat) every day. 2. The letter (to receive) yesterday. 3. Nick (to send) to Moscow next week. 4. I (to ask) at the lesson yesterday. 5.I (to give) a very interesting book at the library last Friday. 6. Many houses (to build) in our town every year. 7. This work (to do) tomorrow. 8. This text (to translate) at the last lesson. 9. These trees (to plant) last autumn. 10. Many interesting games always (to play) at our PT lessons. 11. This bone (to give) to my dog tomorrow. 12. We (to invite) to a concert last Saturday. 13. My question (to answer) yesterday. 14. Hockey (to play) in winter. 15. Mushrooms (to gather) in autumn. 16. Many houses (to burn) during the Great Fire of London. 17. His new book (to finish) next year. 18. Flowers (to sell) in shops and in the streets. 19. St. Petersburg (to found) in 1703. Упр. 2. Передайте следующие предложения в Passive Voice, обращая внимание на место предлога. Упр. 3. Раскройте скобки, употребляя глаголы в Active или Passive Voice. Упр. 4. Передайте следующие предложения в Passive Voice. 1. I bought potatoes yesterday. 2. We shall bring the books tomorrow. 3. They are repairing the clock now. 4. They sell milk in this shop. 5. I have translated the whole text. 6. They broke the window last week. 7. When I came home, they had eaten the sweets. 8. We shall do the work in the evening. 9. He wrote this book in the 19th century. 10. They were playing tennis from four till five. 11. He stole a lot of money from the shop. 12. By six o’clock they had finished the work. 13. At twelve o’clock the workers were loading the trucks. 14. By three o’clock the workers had loaded the trucks. 15. We send our daughter to rest in the south every year. 16. They will show this film on TV. 17. They are building a new concert-hall in our street. 18. They have made a number of important experiments in this laboratory. 19. Livingstone explored Central Africa in the 19th century. 20. By the middle of autumn we had planted all the trees. 21. They will stage this play at the beginning of next season. 22. They have forgotten the story. 23. Has anybody explained the rules of the game to you? 24. They haven’t brought back my skates. Упр. 5. Раскройте скобки, употребляя глаголы в Passive Voice. 1. I am sure I (to ask) at the lesson tomorrow. 2. They told me that the new student (to speak) much about. 3. The hostess said that one more guest (to expect). 4. The newspaper said that an interesting exhibition (to open) in the Hermitage the next week. 5. This new dictionary (to sell) everywhere now. 6. All the texts (to look) through yesterday and not a single mistake (to find). 7. Two reports on Hemingway’s stories (to make) in our group last month. Both of them were very interesting. 8. He said that Grandmother’s letter (to receive) the day before. 9. Two new engineers just (to introduce) to the head of the department. 10. Don’t worry, everything will be all right: the children (to take) to the theatre by the teacher and they (to bring) back to school in the evening. Упр. 6. Переведите на английский язык, употребляя глаголы в Passive Voice. yпражнение можно написать карандашом. 11. Все ваши сочинения будут возвращены на будущей неделе. 12. Это письмо можно написать на одном листе. 13. На этой фабрике делают очень красивые сумки. 14. Письма туда можно посылать только летом, а телеграммы круглый год. 15. Мою подругу каждый год посылают за границу. 1. We thought about our friend all the time. 2. The doctor will operate on him in a week. 3. The teacher sent for the pupil’s parents. 4. They looked for the newspaper everywhere. 5. Nobody slept in the bed. 6. The neighbour asked for the telegram. 7. Everybody listened to the lecturer with great attention. 8. The senior students laughed at the freshman. 9. The group spoke to the headmistress yesterday. 10. The young mothers looked after their babies with great care. 11. Nobody lived in that old house. 12. They sent for Jim and told him to prepare a report on that subject. 1. A marble pavillion protects the house. 2. The boys will paint the roof of the house. 3. Tom Sawyer whitewashed the fence. 4. Her daughters gave her three beautiful dishes as a birthday present. 5. Tom gave Nick a book for his birthday. 6. Our mother tells us stories every evening. 7. Lydia will show you a new book of pictures. 8. A boy showed her the way. 9. They will send us a box of fruit. 10. Five or six small children followed them. 11. In summer the boys often drive the horses to the fields. 12. Ivan Susanin led the Poles into the thickest part of the forest. 13. The waves carried the boat away. 14. We shall do the translation in the evening. 15. They water the flowers regularly. 16. You promised me these books long ago, 17. Bessie’s father gave her a complete set of Walter Scott’s works. 18. Irene’s husband brought her some beautiful shells from the south. 19. The explorers gave the newspaper reporters a long interview. 20. Mr. Wilson will teach you English. 21. The doctor ordered me a month’s rest from studying. Раскройте скобки, употребляя глаголы в Active или Passive Voice. V1 Передайте следующие предложения в Passive Voice. 1. At twelve o’clock the workers were loading the trucks. 2. By three o’clock the workers had loaded the trucks. 3. We send our daughter to rest in the south every year. 4. They will show this film on TV. 5. They are building a new concert-hall in our street. 6. They have made a number of important experiments in this laboratory. 7. Livingstone explored Central Africa in the 19th century.8. By the middle of autumn we had planted all the trees. 9. They will stage this play at the beginning of next season. 10. They have forgotten the story. 11. Has anybody explained the rules of the game to you? 12. They haven’t brought back my skates. V2 Передайте следующие предложения в Passive Voice. 1. I bought potatoes yesterday. 2. We shall bring the books tomorrow. 3. They are repairing the clock now. 4. They sell milk in this shop. 5. I have translated the whole text. 6. They broke the window last week. 7. When I came home, they had eaten the sweets. 8. We shall do the work in the evening. 9. He wrote this book in the 19th century. 10. They were playing tennis from four till five. 11. He stole a lot of money from the shop. 12. By six o’clock they had finished the work. V3 Передайте следующие предложения в Passive Voice. 1. The students greeted the famous lecturer warmly. 2. They have recently built a huge plant, in the town of N. 3. We must finish the work by tomorrow. 4. When I fell ill, my mother sent for the doctor. 5. They looked for the girl everywhere. 6. They did not listen to the boy. 7. She looks after the patients well. 8. They asked for our address. 9. My father looked through these papers this morning. 10. He will give my brother English lessons. 11. A friend of his has shown me an interesting magazine. 12. His friend told him everything. V4 Передайте следующие предложения в Passive Voice. 1. They showed Helen the nearest way to the theatre. 2. He gave his patient some good advice. 3. Mary has told me the news. 4. The people looked at the little boy with interest.5. They examined the paper attentively. 6. We asked him about his holidays. 7. They have already discussed the novel. 8. He did not give me his address. 9. She showed him the way to the metro station. 10. He will introduce me to his friends. 11. They are building a bridge over the river. 12. I haven’t yet translated the article. V5 Передайте следующие предложения в Passive Voice. 1. We turn on the light when it is dark. 2. The students finished their translation in time. 3. Helen washed the dishes. 4. Betty often took her younger brother for a walk. 5. Mother has made some coffee. 6. Have you ironed your dress yet? 7. Nina mispronounced this word. 8. They have told her the truth. 9. She promised us an interesting entertainment. 10. One uses chalk for writing on the blackboard. 11. I shall finish my work about seven o’clock. 12. Somebody has opened the door. V6 Передайте следующие предложения в Passive Voice. 1. They did not invite her to the party. 2. I did not leave the window open. 3. They did not turn off the light. 4. I have invited some friends to tea 5. She has given me an English book. 6. Have you written the letter yet? 7. They have told us a lot о S interesting things. 8. The students have written the test-paper without mistakes. 9. The children have scattered about a lot of things. 10. The girl has put all the books into the bookcase. 11. Snow, will cover the fields in winter. 12. They will hand in the homework tomorrow. 1. Употребите правильную форму глагола в пассивном залоге. The roads (cover) with the snow. – Дороги покрыты снегом. Chocolate (make) from cocoa. – Шоколад изготавливается из какао. The Pyramids (build) in Egypt. – Пирамиды были построены в Египте. This coat (buy) four years ago. – Это пальто было куплено 4 года назад. The stadium (open) next month. – Стадион будет открыт в следующем месяце. Your parents (invite) to a meeting. – Твои родители будут приглашены на собрание. Where is your car? – It (mend) at the moment. – Где твоя машина? – В данный момент она ремонтируется. The books already (pack). – Книги уже упакованы. The castle can (see) from a long distance. – Замок можно увидеть издалека. The guests must (meet) at noon. — Гости должны быть встречены в полдень. 3. Превратите предложения в отрицательные и переведите. Ann was bitten by a homeless dog. The zoo is being reconstructed at the moment. The luggage must be checked at the customs. The job will be finished at 3 o’clock. 4. Дайте полные ответы на следующие вопросы. Также разобрать это упражнение индивидуально можно с репетиторами английского языка по скайпу. Уроки можно проводить в любое время. The roads are covered with the snow. Chocolate is made from cocoa. The Pyramids were built in Egypt. This coat was bought four years ago. The stadium will be opened next month. Your parents will be invited to a meeting. Where is your car? – It is being mended at the moment. The books have already been packed . The castle can be seen from a long distance. The guests must be met at noon. Ann wasn’t bitten by a homeless dog. – Аня не была покусана бездомной собакой. The zoo isn’t being reconstructed at the moment. – Зоопарк не реконструируется в данный момент. The luggage must not be checked at the customs. – Багаж не должен быть проверен на таможне. Souvenirs aren’t sold everywhere. – Сувениры не продаются повсюду. The job will not be finished at 3 o’clock. – Работа не будет закончена в 3 часа. No, they are not. The Olympic Games are held every four years. No, it wasn’t. The Eifel Tower was built in Paris. The final exams will be taken in summer. Christmas is celebrated on the 25 th of December in Europe. английский язык Голицынский сборник упражнений. 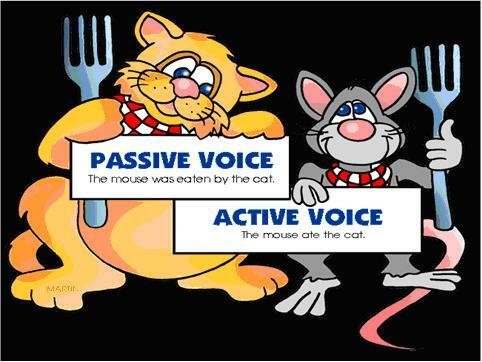 Для того чтобы вы вспомнили, как образуется Passive Voice, сравните его с Active Voice, и вы сразу увидите разницу в построении предложений. Active Voice: Chekhov wrote “ The Cherry Orchard”.. – Чехов написал «Вишневый сад». Passive Voice: “The Сherry Orchard” was written by Chekhov. – «Вишневый сад» был написан Чеховым. Вы обратили внимание, с помощью какого предлога передается лицо, совершившее действие? Правильно, с помощью предлога by. А сама формула пассивного залога очень проста: глагол to be в соответствующей форме и смысловой глагол в форме причастия II. Напомню, что для неправильных глаголов это третья колонка в таблице. А остальные глаголы образуют второе причастие при помощи окончания –ed. Раскройте скобки, употребите глагол в нужной форме, внеся соответствующие изменения. 1. I often (to praise) my teachers. 2. She often (to praise) by her friends. 3. Your question (to answer) tomorrow. 4. Chess (to play) in any season. 5. This subject (to discuss) yesterday. 1. I often praise my teachers. – Я всегда хвалю учителей. 2. She is often praised by her friends. – Ее всегда хвалят друзья. 3. Your question will be answered tomorrow. – Ha ваш вопрос ответят завтра. 4. Chess is played in any season. – В шахматы играют в любое время года. 5. This subject was discussed yesterday. – Эта тема была обсуждена вчера..
1. My parents took me to the Zoo last Sunday. 2. They build these houses in 2002. 3. Ann washed the apples. 4. The girls will paint the windows of the room. 1. I was taken to the Zoo by my parents last Sunday. — Мои родители отвели меня в зоопарк в прошлое воскресенье. 2. These houses were built by them in 2002. – Эти дома были построены ими в 2002 году. 3. The apples were washed by Ann. – Яблоки помыла Аня. 4. The windows of the room will be painted by the girls. – Окна комнаты покрасят девочки. Надеемся, что наши упражнения помогли вам сделать еще один шаг на пути к совершенствованию. Упр. 274. Переведите на английский язык, употребляя глаголы в Past Simple Active или Past Simple Passive. Упр. 275. Переведите на английский, употребляя глаголы в Present, Past или Future Simple Passive. Упражнение 276. Раскройте скобки, употребляя глаголы в Present Simple Passive. Упражнение 277. Раскройте скобки, употребляя глаголы в Past Simple Passive. Упражнение 278. Раскройте скобки, употребляя глаголы в Future Simple Passive. Упражнение 279. Раскройте скобки, употребляя глаголы в Present, Past или Future Simple Passive. Упражнение 280. Раскройте скобки, выбирая требующуюся форму глагола. 1. At the station they will (meet, be met) by a man from the travel bureau. 2. She will (meet, be met) them in the hall upstairs. 3. The porter will (bring, be brought) your luggage to your room. 4. Your luggage will (bring, be brought) up in the lift. 5. You may (leave, be left) your hat and coat in the cloakroom downstairs. 6. They can (leave, be left) the key with the clerk downstairs. 7. From the station they will (take, be taken) straight to the hotel. 8. Tomorrow he will (take, be taken) them to the Russian Museum. Упражнение 281. Переведите на английский язык, употребляя глаголы в Present Simple Active или Present Simple Passive. Упражнение 282. Переведите на английский язык, употребляя глаголы в Past Simple Active или Past Simple Passive. Упражнение 283. Переведите на английский язык, употребляя глаголы в Future Simple Active или Future Simple Passive. Не was talked about. — О нем говорили. Не was sent for. — За ним послали. He was waited for. — Его ждали. He was looked at. — На него смотрели. He was listened to. — Его слушали. He was laughed at. — Над ним смеялись. The house wasn’t lived in. — В этом доме никто не жил. The bed wasn’t slept in. — В этой кровати никто не спал. Упражнение 284 Передайте следующие предложения в Passive Voice, обращая внимание на место предлога. Упражнение 285. Переведите на английский язык, употребляя глаголы в Present, Past или Future Simple Passive. Упражнение 286. Передайте следующие предложения в Passive Voice. 1. Irene’s husband brought her some beautiful shells from the south. 2. The explorers gave the newspaper reporters a long interview. 3. Mr. Wilson will teach you English. 4. The doctor ordered me a month’s rest from studying. 5. Tom gave Nick a book for his birthday. 6. Our mother tells us stories every evening. 7. Lydia will show you a new book of pictures. 8. A boy showed her the way. 9. They will send us a box of fruit. 10. Five or six small children followed them. 11. In summer the boys often drive the horses to the fields. 12. Ivan Susanin led the Poles into the thickest part of the forest. 13. The waves carried the boat away. 14. We shall do the translation in the evening. 15. They water the flowers regularly. 16. You promised me these books long ago. 17. Bessie’s father gave her a complete set of Walter Scott’s works. 18. A marble pavillion protects the house. 19. The boys will paint the roof of the house. 20. Tom Sawyer whitewashed the fence. 21. Her daughters gave her three beautiful dishes as a birthday present. Упражнение 287. Поставьте выделенные глаголы в Passive Voice, внеся необходимые изменения в предложения.